When Being 50 Becomes Your Reason... Not Your Excuse! A few weekends ago, I was in a fun little conversation on someone’s Instagram post. It was a photo of some switchbacks on the South Kaibab trail of the Grand Canyon. The conversation started from the woman that posted the photo talking about how she led a group from the south rim to the river and out in a day. Another woman commented “I did that hike when I was super fit in my early 20’s and it was a challenge”. So, I responded with how I had just done it in December in 2 days and was happy enough with that accomplishment at age 50. Her response, “I pray I’m still able to do awesome hikes when I turn 50!” I guess when we are in our 20’s and 30’s it seems like 50 is ‘so old’! Normally I don’t feel like being 50 is super old, but the last time I did was in November. I joined the Girls Who Hike WI group at the end of October, 2017, there were very few members in the Wisconsin chapter at the time and not too much interaction. I was excited about a new hiking group so I ordered my new member kit and was just hanging out to see what would happen next. Sometime in early November I scrolled past a link on a post for Ambassador Applications for the WI group of Girls Who Hike. I pondered this for a few days, filled out the application but didn’t send it in, and somehow couldn’t stop thinking about it. I talked with a good friend about my fears of sending the application in, and my anxiety about having to write a blog post every month on the off chance that I ever did get the position. I had looked at the Girls Who Hike website and Instagram page, and I surely didn’t see anyone that looked remotely close to 50 years old in their photos and ambassador profiles so I figured I never had a chance anyways. The deadline drew near so I finished the application and sent it off, expecting to never hear back. I did forget to mention that the best news in all this is that I wasn’t the only one that applied. I have the most awesome Wisconsin Co-Ambassador, Morgan Mack, and I’m positive her blogging skills are superior to mine. So, enough of this writing for now, lets go hit the trails! Heidi is the Ambasador for our Wisconsin chapter. You can join her local meetups and discussions through the Wisconsin chapter by clicking here. 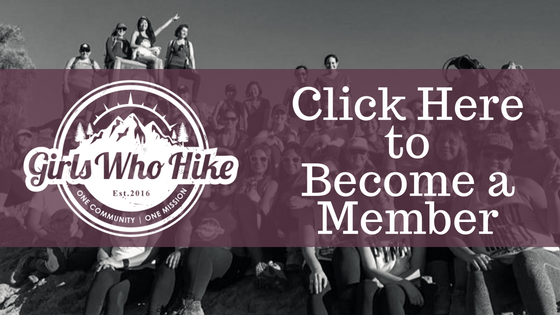 Become a member of Girls Who Hike by clicking here. Ten Essentials: Always Use (Sun) Protection!